Tony McCoy was a mere passenger as he steered Big Buck's to an effortless victory in the race named in his honour, the AP Wins Sports Personality Long Walk Hurdle at Newbury. The race was saved over from Ascot's card on December 18, with Big Buck's' owner Andy Stewart stepping in to sponsor it. Sent off at the prohibitive odds of 2-13 after nine successive wins over hurdles, the Paul Nicholls-trained seven-year-old landed the honours as expected. Lough Derg, a former winner of the race, put up his best effort for some time and despite looking likely to be swamped turning into the straight, he rallied for pressure to see off Restless Harry for second. However, in truth, this race was only ever about one horse and he provided McCoy with a treble and Nicholls a four-timer on the day. Stewart said: "It's a privilege to own him - he's a horse of a lifetime. I thought he (Nicholls) was mad to go over hurdles with him but on the basis he got that right, I'll always listen to him. 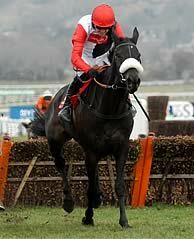 In 2011 he will go for the Ladbrokes World Hurdle. He's the best horse I've owned." Nicholls added: "He's getting more assured and is older and stronger. You can ride him any way you like now and he was probably a lot fitter from his last run. He'll probably run in the Cleeve Hurdle (Cheltenham, January 29) now and then we'll go to Cheltenham and Aintree. Ability wise, he's as good as I've trained - he's got it all." McCoy said: "You don't even need to say anything about a horse like that you just have to look at his form. I hate admitting defeat but there's no point even trying to follow a horse like him around Cheltenham as he's just obviously the best."